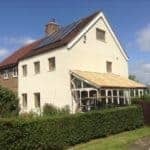 Case study on the radical retrofit of a 1930s ex-council house in Manchester, resulting in EnerPHit (the Passivhaus standard for retrofits) certification. Green Building Store designed the MVHR system and supplied the ULTRA triple glazed timber windows and entrance doors for the project. 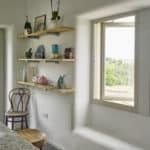 Green Building Store’s triple glazed timber windows and doors and MVHR heat recovery ventilation system, as well as building and consultancy services, chosen for Yorkshire farmhouse radical retrofit. 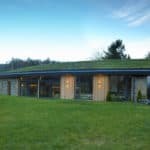 Contemporary family house in Leeds aiming for Passivhaus certification. 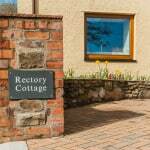 Green Building Store supplied triple glazed timber windows and doors, from its ULTRA and PROGRESSION ranges, for the project, as well as designing, supplying and commissioning the MVHR system. 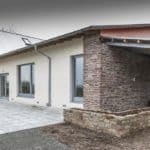 Garway Community Centre is a Passivhaus certified building in rural Herefordshire, designed by Simmonds Mills Architects, Green Building Store’s ULTRA triple glazed timber windows and doors and water saving WCs and urinals were specified for the project. 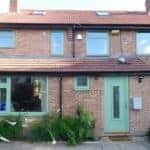 An extensive house renovation in Manchester involved the replacement of all windows and doors with Green Building Store’s ULTRA triple glazed timber range, with a whole window U value of Uw 0.75 W/m2K. Green Building Store supplies ULTRA triple glazed timber windows and Lift & Slide Doors, MVHR Design and Consultancy services for innovative project. 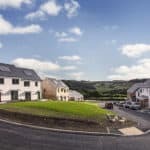 Green Building Store’s triple glazed timber windows/doors, MVHR system, Pro Clima airtightness products & PHPP services chosen for extensive energy efficient refurbishment. 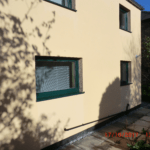 Case study of London retrofit project which met the full Passivhaus standard with Green Building Store’s triple glazed windows & doors and MVHR systems. 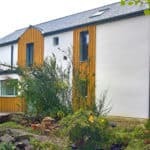 Case study on EnerPHit Passivhaus retrofit project with windows, doors, MVHR ventilation and airtightness products from Green Building Store.